We’ve recently released a series of new features to give your customers a better understanding of when they can pick-up purchases they’ve made on your website. 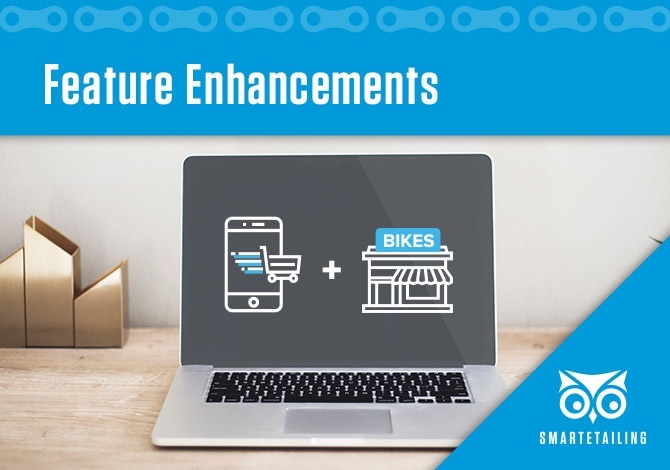 These enhancements make your bike shop website function much like REI, Home Depot, and Target, aligning your site’s shopping experience with modern consumer expectations. In turn, your website can generate more local online sales thanks to an improved in-store pickup experience. Consumers today expect to find an in-store pickup option when shopping on an omnichannel retailer’s website. A time-crunched shopper wants to know what’s in stock at a store before they visit. If an item isn’t in stock, shoppers often choose in-store pickup to avoid shipping charges. They want to know when they will have their purchase. Our latest update is focused on making in-store pickup more prominent and predictable for consumers. Retailers who effectively manage the consumer shopping experience improve customer satisfaction by providing clear in-store pickup expectations, particularly for special orders and store transfers. In addition, this new functionality paves the way for retailers to leverage Supplier Sync. This service allows customers to view and purchase items available from supplier warehouses which get transferred to the retailer for in-store pickup on a day that’s convenient to the customer. This feature gives the shopper a reliable date the item can be picked up rather than a vague “in warehouse” status that can deter a potential sale. Retailers with multiple locations will find additional benefit from this enhancement because consumers are fully informed during the online shopping process. When a consumer purchases an item to pick-up at the store nearest them it will be much more clear when the item is available. This is particularly relevant for retailers who carry different brands at each location. This improvement should reduce common consumer complaints. From a website management standpoint, retailers now have more control of transit times or what brands are available at each location. The updated design prominently features the in-store pickup option as well as ship-to address, with the “add to cart” button and consumer reviews moved much higher on the page to improve conversion rates. Information in the product name and description have been reorganized for improved page load speed and display on mobile devices. Extra attention was paid to improving the shopper experience for multi-store retailers. When in-store pickup is selected for a product, a window pops up to show when an item can be picked up at each location. From that window consumers can select a store to pick up the item and the choice follows them to the cart. Retailers can exclude brands for in-store pickup by location to align with dealer agreements. Retailers with multiple locations can set store-to-store transfer times to communicate the date an item will be available for in-store pickup at a shopper’s preferred location. During checkout, consumers have the option to change the pickup location for their order. Consumers are shown a pickup date that lets them know when an item will be available at the selected location. Consumer pickup location preferences remain consistent during the entire shopping session after a selection is made. For items selected that are in a suppliers warehouse, retailers can set the ship-to-store time for in-store item pickup based on when the order is placed. This feature helps retailers customize messaging based on individual item availability so consumer expectations are clear. To take full advantage of these new features it is important that you've updated to our responsive website templates. Our marketing team can update your website for you at a reasonable price and use that opportunity to make additional modifications so you get the most out of these enhancements. Our Support team can also assist with a self-serve responsive update if you prefer not to outsource the project. Update to responsive website template. Make sure the cart is turned on and POS Sync is enabled for all locations. Enable Supplier Sync for suppliers that you do business with and set the ship-to-store time for each supplier warehouse. Set the store-to-store transfer times. Make sure the locations are properly configured, including current store hours for clear customer expectations. Visit our User’s Guide for a detailed overview with more information on how to configure this on your SmartEtailing website, along with best practices for maintaining this portion of your business. Click-and-collect shopping is easy for consumers and for retailers. To ensure a smooth and successful process for you and your customers, we recommend you review your store procedures and train your staff accordingly. Monitor your orders and address operational hiccups quickly (such as you set store transfer time as one day but it will actually take two). Even the biggest retailers who are serious about omnichannel have people managing this process. Just like closing out the cash register, someone will need to monitor and manage online orders daily. Process special orders in a timely manner with suppliers to ensure you match consumer expectations on timelines. Avoid charging shipping for in-store pick up, even when you have to special order items. “Free in-store pick up” is the standard. To make sure the pickup process goes smoothly, train your staff, have a place to stage orders for pick up, and check in new shipments quickly. You want to avoid confusion when a consumer comes to pick something up that was paid for online. Encourage your customers to take advantage of this feature — you have an expansive online selection and offer free in-store pick up for online orders. The bike market sells the highest volume during the summer months. Your brick and mortar store is likely having its biggest months right now. Consumers are spending money on bikes and cycling gear during the summer in stores and online. We want to help your business capitalize on a portion of those online sales right away. We encourage you to start using these features today and follow-up with feedback on how we can make it better. The click-and-collect business model is emerging and evolving fast and we want to learn from valued clients like you how to best adapt our software to meet your needs and help you grow. Subscribe to our email newsletter for special offers and updates.